Who doesn't want to succeed in a business that they operate? Everyone wants to and in this want of being successful, there are many things that need to be taken care of right from a good product or a service to excellent marketing of the same. Reaching out to relevant people who would be interested in paying for your service or product is not less than a challenge, when you are able to pull sales instead of push it clearly means that you have achieved a lot. But, is it always easy? It definitely takes a lot of marketing efforts across various touch points and stakeholders, which is also called "360 Degree Marketing". In addition to whatever a marketer did to promote their business, they now need to focus on the digital marketing as well since it is not only the need of the hour, but also one of the most effective ways to reach out to the masses. Businesses including Digital in their marketing initiatives are sure to see a difference and the businesses that don't would soon will need to. I recently read the book Digital Spine which is a study in Business Management written by Vikram Kalkat and Reto Gruenenfelder. Vikram carries massive work experience across different continents and is currently on a Business Development assignment across the APAC region with Kaspersky. Reto is the founder of a digital transformation company based out of Singapore and has experience across AI, Blockchain and other technological transformations. The book, Digital Spine, is a quick read with less than a hundred pages to go through and is published by Notion Press. The book talks about the different challenges and the questions that are being raised by the digital transformation and how to address them. The book starts with a setup with why digital transformation is needed and how the classic marketing techniques like the Blue Ocean strategy and the Red Ocean Strategy are failing and why digital needs to be inculcated in the overall marketing initiatives. There are latest trends like blockchain technology, artificial intelligence, cybersecurity and others are discussed and how these all things, overall digital transformation, affects the economy at the micro and macro levels. 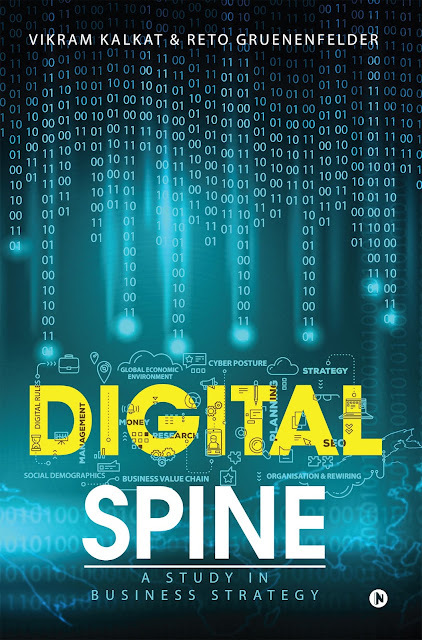 A section that I, personally, liked the most is when the authors talk about the Digital Spine Model which is a simple classification of important factors to be considered for digital transformation by any organization. The book, Digital Spine, is not a detailed one and may not be a go to guide for beginners to setup digital initiatives, but it is quite a handy book for quick references and checks needed for the setup especially for the non digital natives. Another interesting section in the book, Digital Spine, is the section title "Illustrations" where the leading companies of today which have digital as their business base like Uber, Facebook, Tesla, etc.. are discussed and dissected from the digital spine model point of view. Overall, the book Digital Spine is an effortless read and understand book even for almost everyone, how you comprehend and implement the information shared is important. This book may not be relevant to people already in the business of Digital transformation and marketing, but people who are thinking to enter this field or have just ventured in, this would be a good read.